Google Classroom is a free, blended learning platform that offers a variety of benefits for both students and teachers. Whether you’re a 1:1 class or you just rock the computer carts from time to time, Google Classroom can elevate your classroom’s productivity and take workflow management to the next level. Simply put: Google Classroom is my jam, and it should be yours too. Here are 12 reasons why. Paper stacks are heavy. Trust me, your back will thank you when you're no longer carrying that giant teacher bag everywhere. You know, the one that fits all your paper stacks so perfectly. If paper stacks are your thing, that's cool. But I'm betting you'll think not having paper stacks is an even better thing. Don't worry, you'll still find plenty of uses for all those binder clips. Say goodbye to collecting assignments alphabetically or checking names off a list. 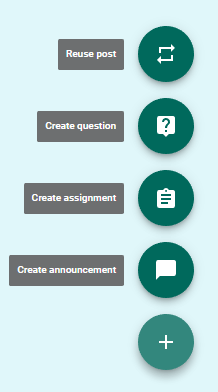 With Google Classroom, you'll be able to keep track of assignments coming in with a simple glance. This makes it easy to know everyone's status and to follow up with students who are missing work. Everything is timestamped, so late work is easily identifiable. Since Google apps are cloud-based — meaning they live on the Internet rather than on your hard drive — work in Google Classroom saves automatically and is accessible from any device. Students can work seamlessly wherever they are, without worrying about clunky flash drives, emailing files back and forth, or losing progress due to computer malfunction. “I left it at home,” and “My computer crashed before I could save,” are no longer excuses you’ll have to entertain. With the app, both students and teachers can enjoy the full functionality of Google Classroom on a mobile device. Students receive notifications on their phone when assignments and announcements are posted, making it easy for students to stay on top of classroom happenings. As a teacher, the app enables you to post from your phone — either right from the app or using share-sheet support (that little sharing icon you touch when you want to share photos or websites from your phone). Can’t get much more convenient than that. 6. Need an extra copy? Check Google Classroom. Stop worrying about keeping track of extra copies. Upload your unit resources to Google Classroom and let students take ownership instead. So when students come to you asking for those two-week old assignments they missed, you can simply direct them to Google Classroom. It's also a great place to post rubrics, checklists and other materials that students frequently reference. Added August 2017, teachers can now can view a single list of an individual student’s work from the entire year. This means you’ll have easy access to all the work from every student all year long — ideal for student- or parent-teacher conferences, child studies, IEP meetings and more. Guardian Summaries will send families a weekly overview of your classroom stream, including announcements and assignment due dates. If a student is missing any work, it’ll show that too. To learn more about Guardian Summaries and how to enroll parents, visit Everything You Need to Know About Guardian Summaries. Google takes feedback seriously. 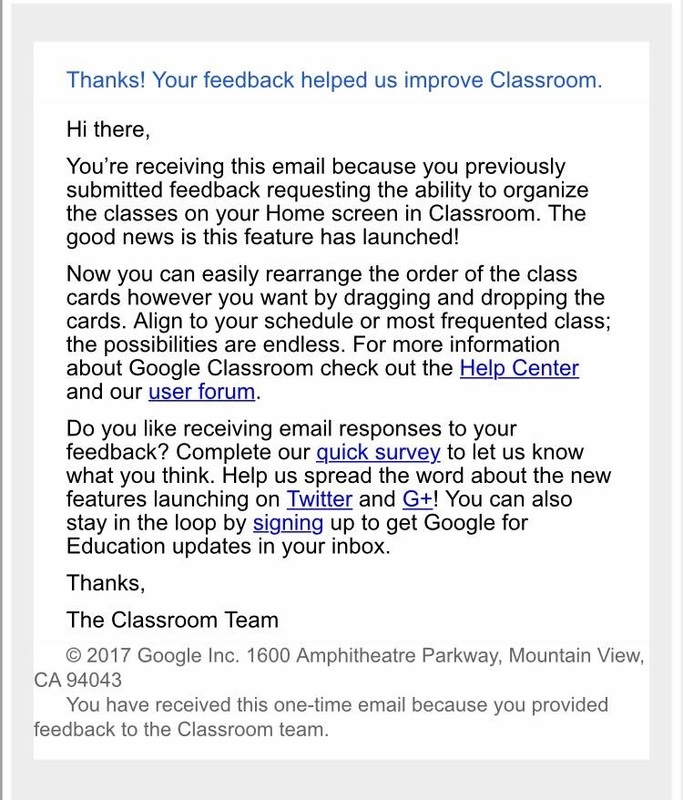 Google Classroom is a fantastic tool already, but it’s constantly improving based on the feedback of its users. You can submit feedback anytime by clicking the little question mark on the bottom left of the screen. Last year I submitted feedback asking for the ability to rearrange classes on the home screen. Recently, Google emailed me to let me know they added that ability with their latest round of updates. Pretty neat stuff. To learn more about Google Classroom, check out the free Google Training Center.